Determining how to make the perfect vodka martini is a difficult task. If you ask fifty different martini enthusiasts the best ingredients, measures and mixes to use, they'll likely give you fifty different answers. This article, therefore, provides a basic recipe, as well as information on using your knowledge and taste buds so you can have the final say on how to make the perfect martini with vodka. Make no mistake about it, there's a method to making a great martini. but there's plenty of room for you to be creative and interesting as well. Here's how to make the perfect vodka martini, shaken or stirred, for yourself and for friends. Vodka is the most important ingredient in the mix, and the most misunderstood. Not just any vodka will do when it comes to making the perfect martini. The cheapest vodkas will allow an unpleasant aftertaste to permeate the drink. Therefore, choose a quality vodka such as Stolichnaya, Grey Goose or, if you've got the money, the uncontestable Rodnick. The best vodka does not have a bitter aftertaste; in fact, it has no aftertaste whatsoever. Rather, it will give your drink the "kick" it needs, and it will nicely mix with all the other ingredients. When the right vodka is used, the vermouth and additional ingredients fade into the background. If you use a high quality vodka, and enough of it to achieve the flavor you desire in proportion with the additional ingredients that you choose for your creation, you'll be well on your way to discovering how to make the perfect vodka martini. Perhaps the most important aspect of making the perfect martini is the vodka/vermouth ratio. The dryer you like your martini, the more vodka you will have to add in comparison with the vermouth. Granted, it takes a little bit of practice and discernment to hone your taste buds and determine your preference before you can perfect this ratio. Start out with a three to one vodka-to-vermouth ratio, adjusting for a stronger drink if you prefer one, and go from there. A three to one ratio creates a very dry martini, so increase the level of vermouth if you want a bit more "bite" to your drink. Decide whether you want to use a dry vermouth at all, or if you'd rather spring for something more creative. Vermouth is a wonderful drink when the correct specimen is chosen, but if you're not one to spring for a bottle of vermouth that costs more than ten bucks, you might want to experiment. When it comes to this ingredient, you get what you pay for. Lillet Blanc, a great vermouth substitute, will cost far more than the dollar fifty you'll pay for the green vermouth bottle with a white paper label, but will add a richer flavor. Some people insist that a touch of olive juice (known more appropriately as olive brine) is the final ingredient to make a decent vodka martini a perfect one. Others hold fast to the belief that only vodka and vermouth are required for the best martini you'll ever try. Of course, still others will point out that the flourishes, such as using a lemon rind instead of an olive on the toothpick, will determine whether a vodka martini reaches the heights of perfection. For real martini lovers, outside of vodka and vermouth, the additional ingredients are meant only to impart a sweet or pleasantly bitter nose and aftertaste to your final product. However, this does not mean that you should treat these ingredients lightly. A very different effect is achieved by a squeeze of lime or a shred of lemon rind than by a hint of olive brine. A cocktail onion or a few drops of bitters can also go a long way towards making this martini characteristically yours. When it comes down to these last few ingredients, your taste will entirely dictate the outcome of your drink, so be as creative as you like. 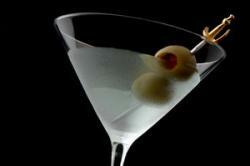 Almost all vodka martini recipes are quite strong, however, so make sure you don't overdo it. 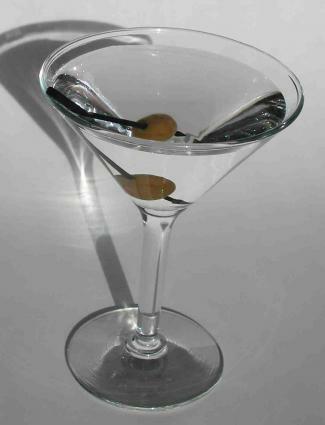 Sampling a couple of vodka martini variations can be a fun way to spend an evening with friends.